Before I set off for Paris, I figured I would return home super excited to cook again after my long break from servitude daily meal prep. However, I am still finding my groove again. As it turns out, dining out in Paris for many days only inspires one to return home and…order pizza? dine out more? serve cereal for dinner? All of the above. Maybe it’s the weather, maybe it’s the post-vacation blues, but I’m really not all that into cooking these days. So, anyway, congratulations Mr. Bob Blumer, you have the honor of having created the recipe which I used for one of the first real post-Paris meals I bothered to cook, and the only one worth publishing. First and foremost, this salmon passed the Andrew Test. Andrew is my picky one who some days likes salmon, some days does not like salmon. He seems to like salmon only when I’ve not bought enough of it and counted on him NOT liking salmon that meal. We had enough salmon last night, so he was gearing up to not like it, but he was immediately hooked after one bite and declared it his favorite new salmon. I agree with Andrew. This recipe uses 3/4 cup of real maple syrup, which I realize can be kind of pricey. DO NOT USE FAKE SYRUP, THOUGH. NO MRS. BUTTERWORTH! If you want to use less maple syrup, start with 3 tablespoons of syrup to 1 tablespoon of soy sauce and then increase proportionately until you have enough marinade. Also, please give this at least 24 hours to marinade. It makes a huge difference. I made this once before and only marinaded a few hours, and it wasn’t nearly as good. This recipe calls for the grill, but I cooked it in the oven at 450 for about three minutes a side. In a small deep bowl, or a resealable plastic bag, mix maple syrup and soy sauce. Add fillets so that marinade completely covers fish. Marinate in the refrigerator for as long as possible (a minimum of 4 hours, but ideally 24 – 48). Turn salmon (or bag) every few hours. Preheat grill to medium-high direct heat. Place pepper on a small plate. 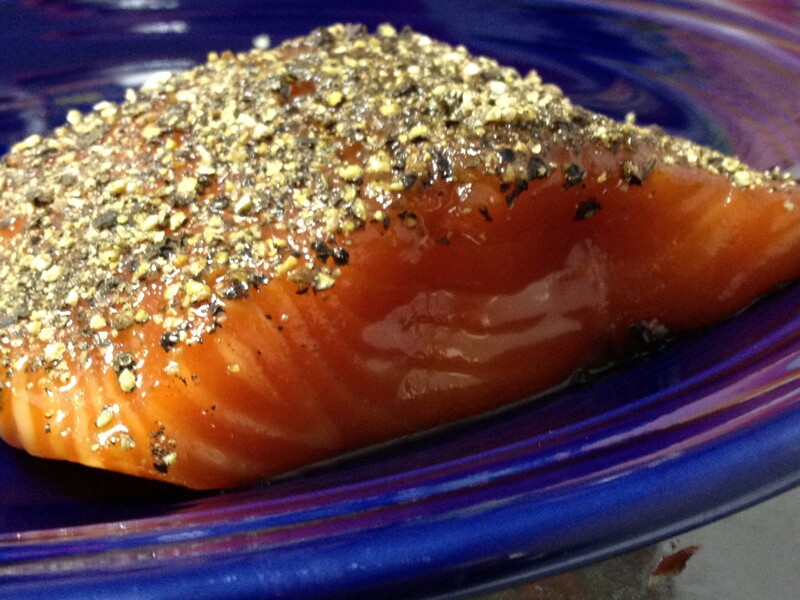 Remove salmon from marinade and pat top side into cracked pepper to coat. Grill for approximately 3 minutes per side, starting with pepper side down, or until salmon is just on the verge of turning opaque. This entry was posted in Main Dish and tagged bob blumer, easy salmon marinade, maple soy salmon, maple-icious salmon by Mom Mom's Apron. Bookmark the permalink.